1) Dress Properly. Wear a lucky shirt if you have a lucky shirt. Women may opt for plunging necklines to distract opponents from the game—it’s best to hide the depth of the neckline with a scarf or jacket until a crucial moment. Choose opaque sunglasses that make you look cool if you want to conceal all eye movement from your opponents—take them off when you want to increase trust. Headwear is optional. Caps that reference poker tournaments are preferable to trendy sports brands and hoodies. Cowboy hats look forced, unless you happen to really be a cowboy. Avoid bows. 2) Choose A Magic Seat. When a space opens up at the poker tables, you often have to take it until your first choice becomes available. The seat where someone has won a bunch of money is often considered the magic seat, but sometimes the magic leaves with the player because of his/her lucky shirt. Some players change seats and tables continuously until they find the magic seat, a process that may require spiritual guidance. 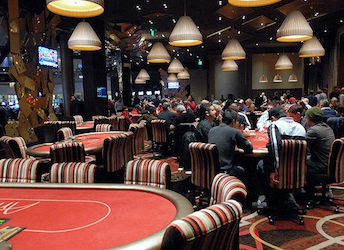 Other players know that their magic seat is always three chairs from the left of the dealer at a north-facing table. Once you get to your magic seat, arrange the cushions and chair height to increase power. 3) Ritually Array Your Chips. The magnetic force of chip structure should never be underestimated. Some players mimic the chip tray, and stack 20 high to ensure an easy count and transfer. Other players opt for a stack height even with the table rim to increase unity with the pot through complex geomantic forces. Men sometimes build a single, phallic stack that, because of the lucky shirt and/or magic chair, may reach incredible proportions, risking an awkward tumble—consult astrological forecasts before attempting. Players who painstakingly align the alternating colors on the edges of their chips, creating neatly striped stacks, are either OCD or owe their allegiance to an exacting god whose power is doubtful. Frank Gehry or Frank Lloyd Wright structures, while entertaining, repel additions. Choose a fluid structure that admits, even encourages, enlargement. A heap of unstacked chips is considered sloppy. Mojo is never sloppy. 4) Bring Your Amulet. In keeping with the like-attracts-like principle, coin amulets increase money because they are money (international currencies are preferred). Flat pebbles and medallions, placed on top of a chip stack, add luck and decorative flair. Small leprechauns, elephants, car and airplane models are usually positioned in front of the chip stacks to ward off depletion. Although current trends favor tiny Buddhas, it’s best to avoid religious amulets, which introduce potential conflict between doctrine and sin. Rabbit’s feet and other politically incorrect amulets may also attract negative energy and should be avoided. Shrine building is not allowed—large amulets are discouraged, as are multiple amulets (dealers may request that you remove it/them from the table). Amulets that dangle from the top of the chip stack, while lending a protective aura, tend to interfere with chip movement and are usually deemed fussy. Since players monitor each other’s Mojo, be prepared to discuss the origin, meaning and intent of your amulet. Never tell its secret. 5) Correctly Touch Your Cards. After the deal, lift the edge of the card from the poker table—just high enough to see the number—while maintaining maximum contact between the card and table felt. Cupping the cards with one hand while lifting the edge with the other concentrates power. Timing is critical and varies according to mastery and style. Some players look at each card as it is dealt (see “Summoning,” below), others wait for both cards, and still others, in the throes of clairvoyance, bet pre-flop without looking at the cards. Playing the hand to its conclusion without consulting your cards is reserved for those with advanced divinatory skill. Unless you are in the magic chair, lifting the cards off the table prior to showdown severs auspicious connections and usually results in defeat. For this reason, many players hold the image of the cards firmly in mind and refuse to touch the cards again until the hand’s conclusion. Avoid offending the Poker Gods by throwing in a losing hand with disdain. Lightly toss your cards toward the dealer. If you do it properly, the cards will arc to the level of the dealer’s heart chakra, strengthening bonds, and land just in front of his/her chip tray. 6) Carefully Manipulate The Chips. In order to increase magnetism between the pot and your stacks, pay attention to chip technique when placing your blinds, calling or raising. Some players slide the chips across the felt in order to visualize, and thereby strengthen, energy lines. Players skilled in numerology and/or Kabbalah spread the bet out on the table to emphasize specific quantities in magic formulae. Sloppy tossing into the pot often causes the chips to roll into another player’s stack in a symbolic transfer that becomes déjà vu in a subsequent hand. 7) Choose A Sacred Libation. The color of the drink is very important. Select a drink that matches, or complements, your lucky shirt. Place it in the cup holder directly between your heart chakra and the solar plexus—the rate at which the ice melts indicates whether your play is “hot” or “cold.” Advanced players may be able to augur the future of a hand by carefully interpreting the bubbles and/or swirls visible in the liquid. Tea and coffee lend themselves to fortune telling, particularly the Starbucks brand, with its implied celestial currency (star + bucks). Consumption of alcohol usually depletes a player’s Mojo unless the player is seated in the magic chair. For this reason, advanced poker players are usually ascetics. You can tell them by their white cotton garments and their tendency to sip water at specific intervals calculated according to the lunar clock. Never, ever allow your libation to drip or spill on the table, cards or chips, lest you arouse the anger of the other players, dealer, and/or floor manager. Cocktail waitresses may come to your aid in this unfortunate situation—if they do so, tip them generously to regain your lost or “spilled” power while uttering an incantation of apology. The magic circle of the poker table should always be kept dry and clean. “How to Increase Mojo at a Las Vegas Poker Table: Texas Hold ‘em secrets revealed, Part II,” featuring discussion of Dealer Manipulation, Player Manipulation, Omens, Summoning and Numerology, is scheduled to post next week. This entry was posted in Gambling and tagged amulet, ascetics, aura, call, casino, chips, cocktails, culture, dealers, desert, dress, fashion, flop, fold, Frank Gehry, Frank Lloyd Wright, gambling, libations, luck, lucky, omen, poker, raise, seat, suited, sunglasses, tables, Texas Hold 'em, Vegas. Bookmark the permalink. Well done! The star + bucks + ice + solar plexus confluence is brilliant.